Yup, scrapbooking has captured my imagination. 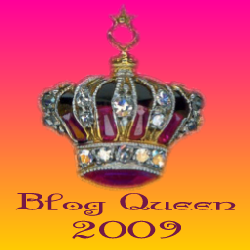 After my last post I had several lovely comments (please keep 'em coming chaps...or I might stop blogging!!) 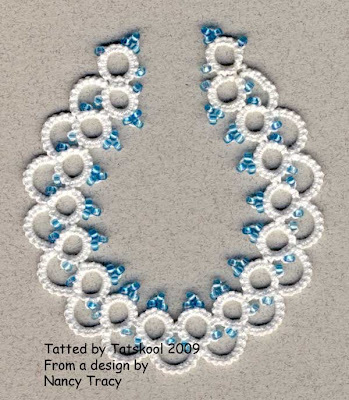 saying that I could use tatting as embellishments. 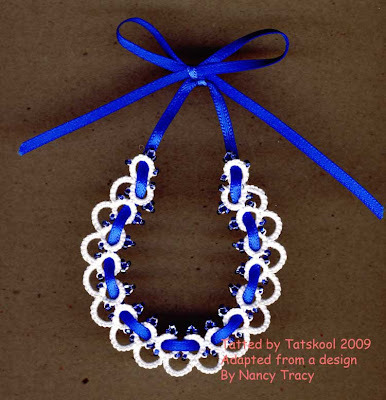 When I came home from the course it was like something had exploded inside my head, tatting could adorn my scrapbook pages..it has a purpose! !...but not only that...scrapbooking could maybe be a way to show off the tatting itself! I immediately thought of my Coral Reef thread and the photographic story behind it culminating in my Coral Reef doiley.mmmm but will I ever do it. So much better than having it languishing in a plastic sheet. Terrible I know but I just don't use doileys. It's very lucky for tatting that I can incorporate it in scrapbooking or the death knell might have sounded for it. I find that I can only do one craft to the best of my ability at one time and this has resulted in the end of so many crafts that I always intend to go back to! Scrapbooking is much harder than it looks unless you are a naturally brilliant person...which I am not. This next page.. based on a layout that I learned at the class has taken me two weeks to finish and resulted in a huge addition to my stash. First you have to choose the background page..it is amazing when you try a photograph out on different backgrounds, each one picking out a particular colour in the photo. The true demented scrapbookers have a page colour and embellishments in mind and go out and buy an outfit for the baby to coordinate with that colour!! Crafting always tends to make me panic buy...as in beads and threads....as if another chance to buy will never come along...so that I will have a selection to choose from. 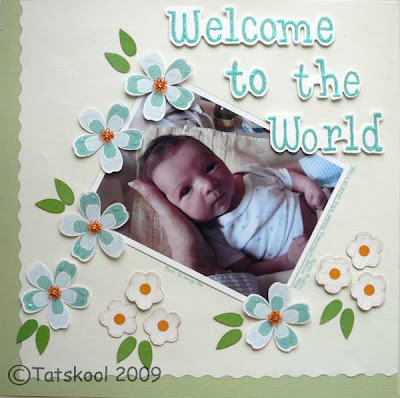 The you have to decide on a layout to display the photo and for the placement of supplementary decorative sheets. Then there are the embellishments and the title and the journalling so that you will remember ( and others to come) what that photo was all about. So wait no more here is my 3rd page done on my own (mostly)! It's a pity that you can't see the sparkle on the letters and the flowers and the diamante in the middle of the tatting embellishment on the flowers..Yup just a tiny bit of tatting this time. I had to go and buy new letter stamps as scrapbooking needs large bold letters. The background paper has a tiny stripe that you can't see. I am blown away at how beautiful this page looks, good enough to frame, and how I will remember that day when grandbaby was just 4 days old. I have had Julie Patterson's pattern for her Spring Flowers bookmark for a long time, but it wasn't until I saw Christina's working of it on her blog (sorry I can't find the link), that I was inspired to try it. My first one was in Flora 20 in bright, bright green and lilac, and then one in one of my early HDT trials Lavender and yellow. It turned out to be addictive seriously addictive. One of those things that makes me think...what would it look like in these colours and with a different tail. I like this pattern a lot..probably because of it not having picots..it has a lovely clean crispness about it and it's very easy to do once you get the right tension. Make sure to make picots that are not to small between the petals of the flowers so that the flowers lie flat. So I rummaged through my colours....little bits that were not long enough for a big project ...and what did I find but lots of short lengths of Rainbow Bright!! Now I swear that after my marathon tat with this colour for all of Jon's snowflakes before Christmas...I said that I never wanted to see Rainbow Bright again!!! But I was wrong....this colour never ceases to amaze me!! Just look at the way the flower colours on the two sides of the stem repeat themselves, no matter where I start. And so I was hooked again!! Here you see different greens, flora and Rainbow Bright solid green and different tails featuring, spirals and lock chains. Click on the picture to see the detail. 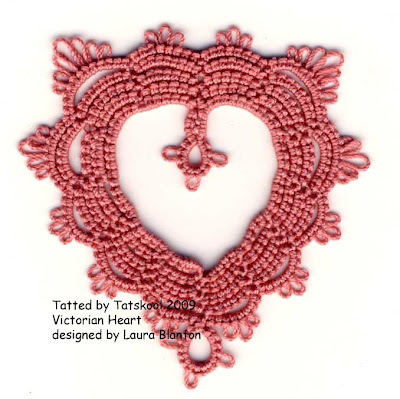 Now I am going to go and do lots more tatting!!!! lots! I have tatted this heart for my good friend Laura to wish her well. The design is hers and is called Victorian Heart...a very good name I think. It is tatted in Flora 20 and took 1.4m on the ball and 4m on the shuttle and measures 5cm across. the colour is a dusky pink....not very inspiring so lets have some computer generated colour variation to see what it would look like. Mmm! yummy colours, I love doing this it's like making a selection box...and talking of selection boxes I just received a yummy one from my son for Mother's day...so it's tatting and chocolate for me this evening. Happy Mother's day to all my fellow tatter mums and very best wishes to mum, tatter and friend Laura...I love your design. The weather today is perfect, warmish and sunny..just like a spring day should be. Doesn't it just make you feel good. While I was away last weekend I went to a scrapbooking class with my daughter. She scrapbooked her wedding album and it is just gorgeous, unbelievably gorgeous. This was my first time doing it. She lives very near to a craft center...how cool is that, and in the center is a cardmaking and scrapbooking shop. Here is the blog entry about our class with the layouts that we beginners were using to start us off. I chose to make a double page spread (using layout number 3)about the Christening gown worn by daughter and grandson. It was a totally absorbing day, cut short as we had to leave early to return home. I didn't think that I would ever finish my work as I rarely do my homework!! but today I finished it and am dying to do more, with a head full of ideas that will never come to fruition. Oh no Not another hobby, I can't take it!!! Now I need to do another page about the christening gown and it's history. Of course this involves amassing a whole new stash!! well not quite only 12 by 12 sheets and an album of course. My card making stash will come in handy and the great thing about scrapbooking is that all the effort involved...stays here with me!! Happy St Patrick's day from the Emerald Isle. The day has come too soon, I haven't even got out my huge stash of necklaces from the States, but I am wearing green...sort of! I won't be doing my necklace throwing fun bit with the Brownies until friday...by then I will be in the mood! My shamrock tatting.....oh and I do have a 4 leaf clover that I found in the grass when I was at school...I keep it safe in a tiny box...I would scan it and show it to you if I could remember where it is!!! Ha!! 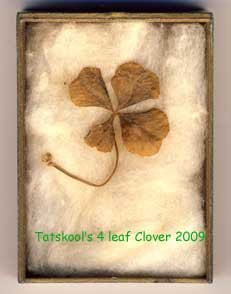 I found it safe and sound...genuine English 4 leaf clover..remind me to put it back where I found it!! It must be 50 years old...wonder how long the luck lasts!!! gosh nearly broke it trying to slide the lid back on..that would never do. Ok so you want to see green tatting and so you shall. I tatted Karey Solomon's Clover Fan Bookmark from her publication Tatting Times. It uses lock chains, and is very unusual. Oh and by the way, Fergal has heard from Brendan....go see the leprechauns blog!! Weddings have very much been in my mind for the last few weeks. My son asked his girlfriend to marry him a couple a of weeks ago (great excitement) so that needed an engagement card. The new Forever Friends sheets are wonderful. 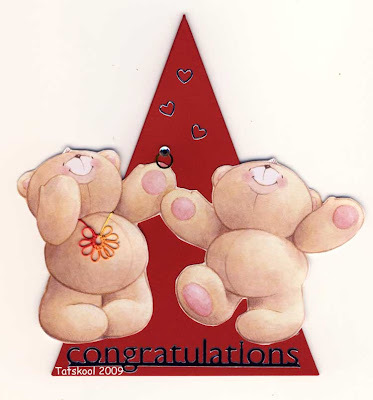 We have been invited to two weddings in England and Wales this summer and so there were acceptance cards to be made. A simple card but I hope effective. A friend has a shape cutter that makes the little tiny envelopes. 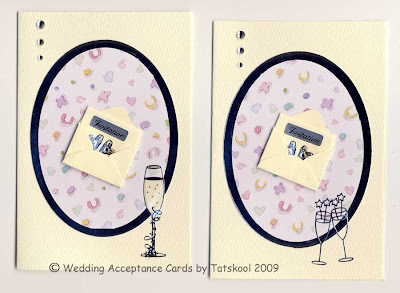 The little card inside can be taken out and has the invitation to the wedding written inside. 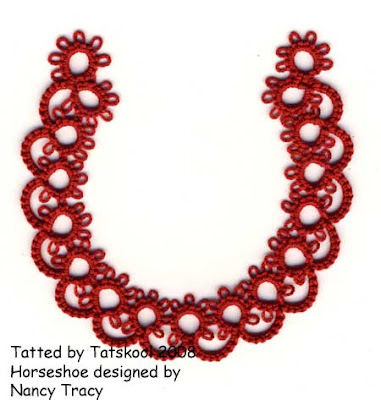 Last year I had tatted Nancy Tracy's Horseshoe design, from her Be-Stitched newsletter. I liked this a lot but realised that it needed much smaller joining picots to hold the shape. I thought that a ribbon threaded through would hold the shape and look pretty...but I found that an odd number of rings to thread through didn't work so I added another ring and chain to the pattern...and it worked perfectly. 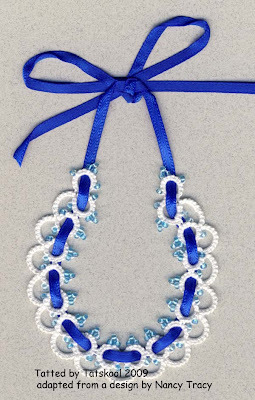 Of course I also had to add some beads, three on the inner picots. 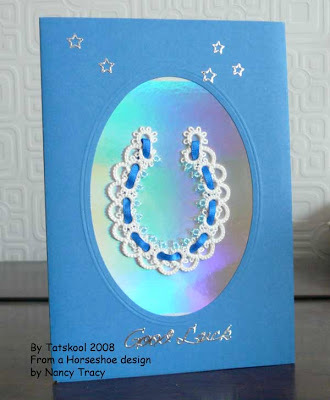 Mounted on holographic card that catches the light it made a wonderful Good Luck card. More rainbow beads on the outer picots and a maroon ribbon. ready to to go inside one of my acceptance cards. Here are my two favorites on a dark background. 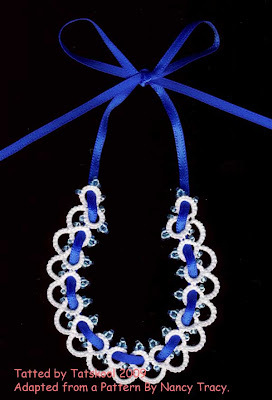 silver lined royal blue beads. Which do you like the best, I hope that the brides will like them. Tatted in Flora 20 it took 3.5m on Sh1 and 1.5m on Sh2, I added 90 beads to Sh1. I have a drawer full of old lace and embroidery items that I just couldn't throw away after my mother died. I went through it all over again recently when clearing out the drawer and there are some gems... I am so glad that I kept it. 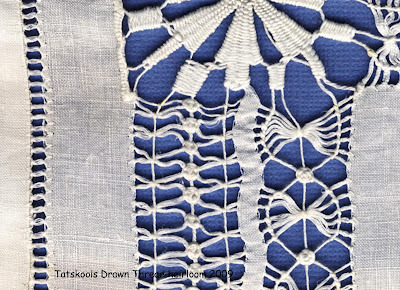 This particular piece meant nothing to me until I started to learn Drawn Thread Work and then I took another look at it and thought WOW!!! now that really is something! It's quite a large piece at 28 by 20 inches, I suppose it must have been a tray cloth for a large breakfast tray...very posh! What intrigues me the most and I will never know, is who made it, could it have been my mother when she was young. I know that she did a lot of embroidery and crochet but can't really imagine her making this but as I said I will never know now. This really deserves a closer look. 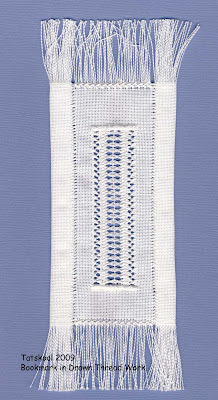 The edging is crocheted, around an broad section added on to the center piece. The center piece is amazing look at the clunies in the corners. and an even closer look. 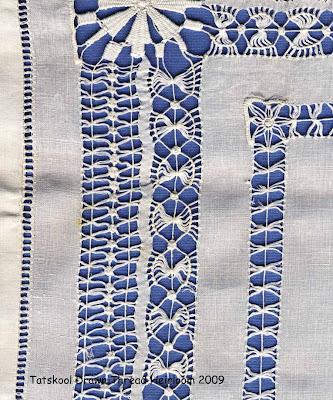 I can hardly see the cross threads in the linen with my naked eye. I must admit that after my first lesson and when I saw this cloth I thought that the inserted work had been added. 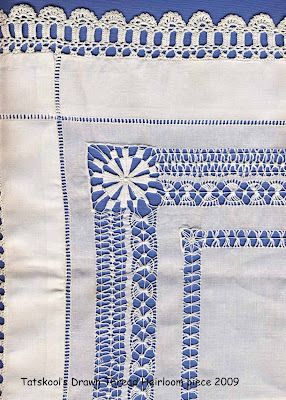 I just couldn't believe that anyone could count and draw out threads from linen this fine. It couldn't be done except with a microscope. But my teacher said that the threads had been drawn out. I am in awe of whoever made this. 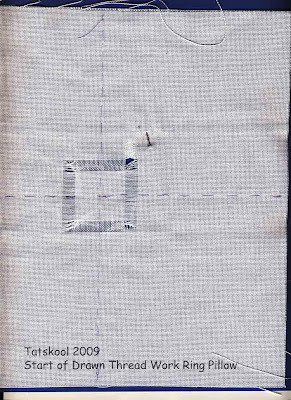 Using 28 count thread is tiring but the thread count per inch of this linen must be enormous. It must be 100 threads to the inch at least. I have to wash it and preserve it, no harsh chemicals, no starch, iron with a damp cloth above and below it and store rolled round a tube in acid free tissue. Rolling it round a tube stops it creasing which could crack the fabric and makes it always crease free to take out and admire. It was my Lace Guild meeting again today and I finished my Drawn Thread Work Bookmark, this is the result of a day and a half's work. Isn't that just lovely. Its quite big for a bookmark at 8.5in by 3in. Do click on it to take a closer look. That was a day and a half of my life!! 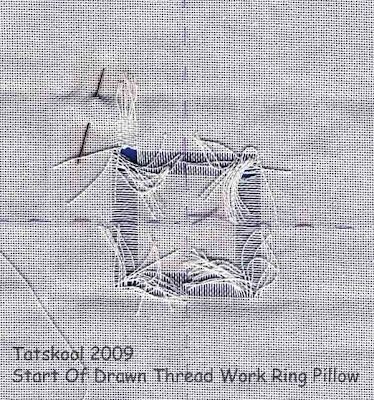 My next project is a Ring Pillow. this is as far as I got this afternoon. 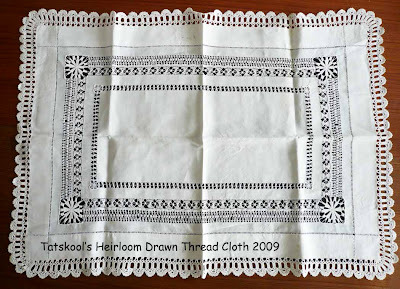 I have just taken out the threads to form the motif in the centre. this is the front of the work. At the back I have dozens of ends to sew in, like the few that I have already done,before I can proceed. Preparation in the longest part of this craft. Now if only I did my homework I would get a lot more done!! I am supposed to make a stitch sampler on my spare bits of linen, before my next lesson!! !